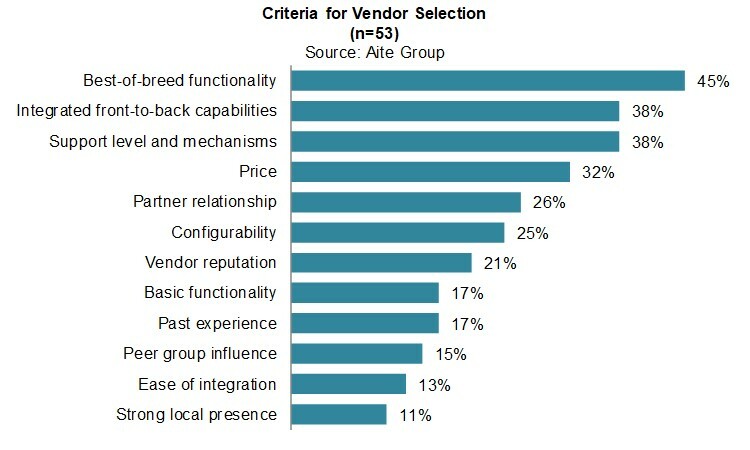 Buy-side firms want fewer vendor systems and tighter integrations for improved straight-through processing. London, 10 April 2018 – Buy-side firms’ core portfolio management systems encompass the front-office and middle-office technology—from portfolio construction and trade inception to position keeping and performance and risk analytics—and the back-office’s accounting engines. This wide range of functions is reflected in a wide selection of vendors, some of which focus on front-to-middle-office functionality or on back-office accounting while others attempt to offer a full front-to-back platform. This Impact Report is based on 58 Aite Group interviews conducted with buy-side market participants between August 2017 and December 2017. It provides insights from both the buy-side community and vendor community on the current global portfolio systems market and profiles 38 firms: ACA Technology, aixigo, Axioma, Backstop Solutions, Black Mountain Software, BlackRock Solutions, Bloomberg, Broadridge, Calypso Technology, Charles River Development, Eagle Investment Systems, Enfusion, ERI Bancaire, Eze Software, FactSet, Finartis, Finastra, FIS, Fundamental Software, FundCount, HedgeGuard, Horizon Software, IHS Markit, Jump Technology (Informatique), Linedata, Murex, NeoXam, Nirvana Solutions, Nomura Research Institute (NRI) Financial Solutions, Numerix, Patronas Financial Systems, Profile Software, Quantifi, SimCorp, SS&C Technologies, Systemic, Temenos Multifonds, and XNET. This 84-page Impact Report contains 18 figures and 42 tables. Clients of Aite Group’s Institutional Securities & Investments service can download this report, the corresponding charts, and the Executive Impact Deck.